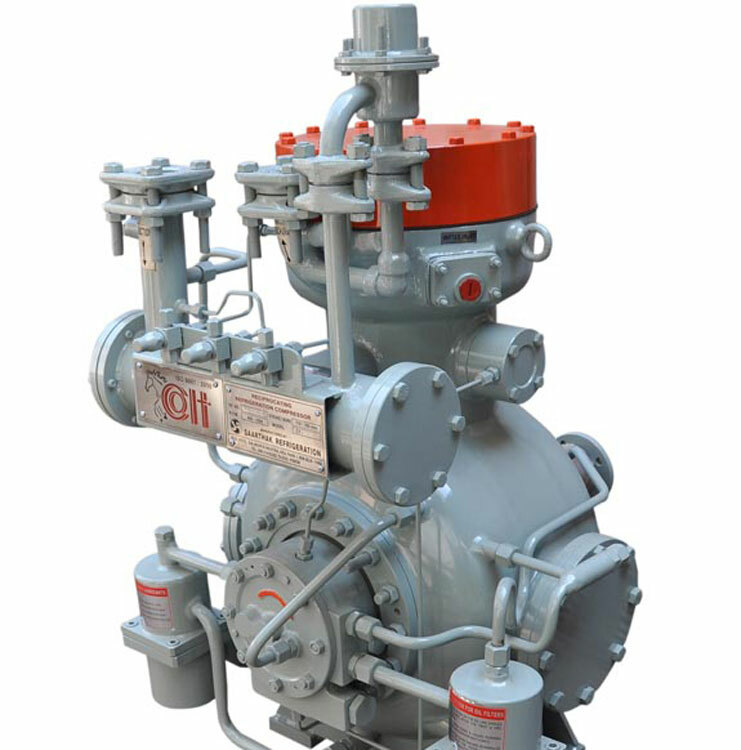 Three Concentric discharge valve rings ensure ample gas at flow passage at low lifting height ensuring less number of breakdowns. The use of sinusoidal spring made of Sandvik Steel, Sweden together with precision machined and lapped surface result in a trouble -free operation for a remarkable long time. 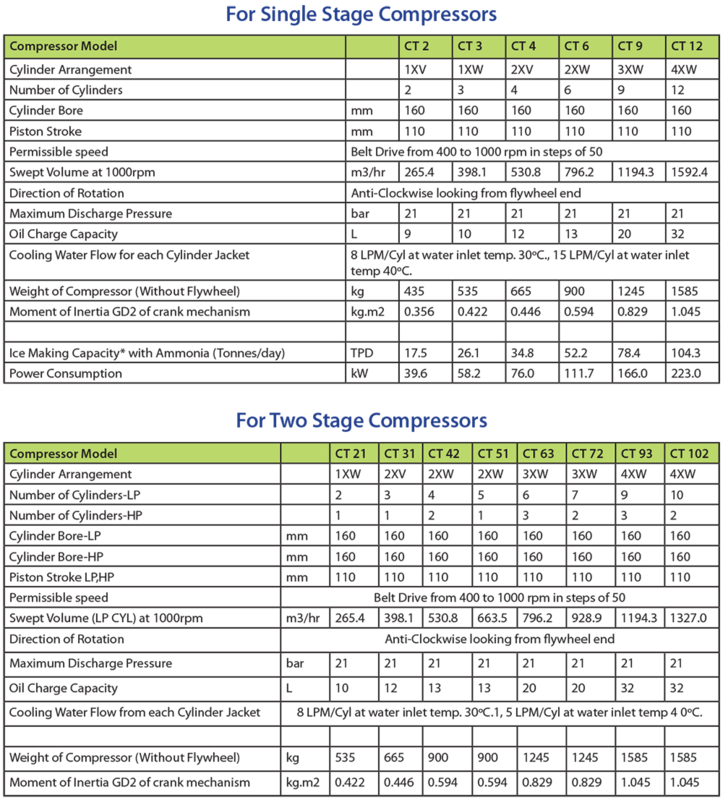 Minimum inventory for spares since most parts are identical throughout the CT-Series Compressors. Interchangeable cylinder liners are made of fine-grained, centrifugally cast, alloy iron. Fine boring and honing results in a mirror smooth running surface. A hydro-mechanical suction valve lifting mechanism on each individual cylinder achieves loading and unloading. For unloading, the suction valve ring is lifted from its seat in the cylinder collar by spring tension. Admitting controlled oil pressure to the control piston, allows the suction valve ring to descend on its seat effects loading of the cylinder. Suction gas strainer is another example of easy maintenance. Inside gauze strainer element can be easily removed. Forced lubrication by a gear pump, driven directly by the crankshaft. 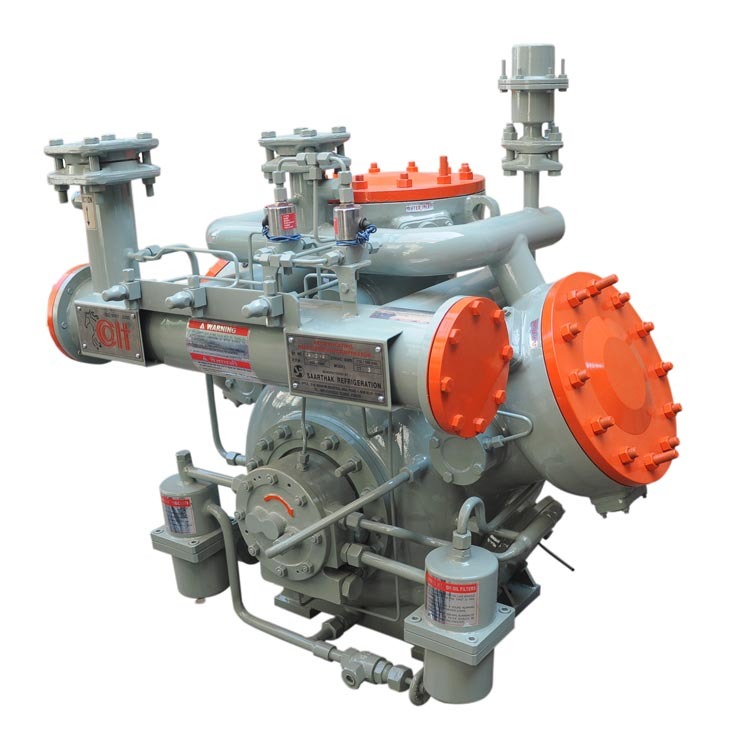 The pump incorporates a differential pressure regulator to provide separate pressures for two oil systems: lubrication system and control oil system (Loading and Unloading). Automatically operating hydraulic delay valve ensures complete unloaded start. A metal gauze suction filter element and a throwaway discharge paper filter cartridges are provided for excellent filtering capacity of the lubricating oil with rare earth magnet ensure trouble free long running life. Oil return flow is visible with built-in Sight Glass. Bearing surfaces of the high quality nodular cast iron crankshaft are ground to fine tolerances. Each crankshaft is dynamically balanced together with the counter weights resulting in smooth vibration free running. Main bearings are white metal lined steel backed bushes,pressed into the cast iron bearing covers. Intermediate bearing blocks are provided with spit type bearing shell of the same type. Is ensured by built-in arrangement of buffer spring which protects compressor from incidental liquid hammer. As piston/connecting rod assembly can be removed without removing the cylinder liner. Parts subjected to wear are easily accessible through large service doors with minimum special tools. Large water jacket around the cylinder with flange type covers are provided for easy cleaning and descaling avoids gas cutting and acid cleaning. Service covers are large in size. Gas tightness and impact proof. Smooth internal surfaces and chemical cleaning process guarantee the good oil condition during operation. Perfect sealing and low oil consumption due to 3 compression and 2-oil scrapper rings on each aluminum alloy piston thus minimizing oil carryover through discharge gas line. The forged steel connecting rod is drilled through for pressure lubrication of the piston pin. Steel backed white metal shells on big end and Needle Roller Bearing on small end of connecting rod. The complete piston & connecting rod assembly can be removed from the top for servicing without withdrawing the cylinder liner which makes it easy for maintenance. Smooth internal surfaces with chemical cleaning process guarantee the good oil condition. Each cylinder is equipped with a hydraulically operated valve lifting mechanism giving absolutely capable capacity control and 100% unloading. With special epoxy primer and Polyurethane (PU) paint preceded by shot blasting and chemical treatment process ensure long life & corrosion protection. Powder coating is optional if demanded. Maximum safety with failure detection LEDs display. Pressure gauges and cut-outs are secured in metallic panel. Toggle switch for operation of solenoid valve. Hour meter used as a reference for running time of compressor for regular maintenance. To keep the discharge temperature low. 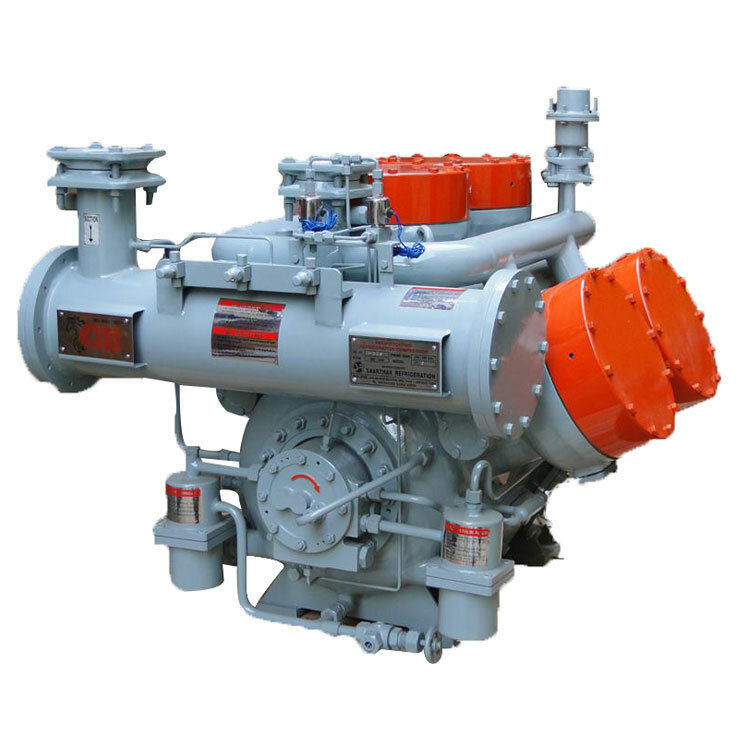 To increase the life of compressors.